My husband has used 5-hour ENERGY® for as long as I can remember when he's had long shifts at work several days of the week to help give him a little boost to get through the day. I've personally never had them before now. I figured if I was going to be writing about them it was about time I gave them a try for myself right? I first took a little taste of the shot by itself to see just what it tasted like straight. I have to say I now understand why they created this contest, it was a little bit on the strong side for my preferences. So I mixed up the rest of it with some orange juice to go along side my bagel for breakfast. I was having one of those mornings where I just couldn't get myself going so I figured why not put it to the test right off. After I finished my breakfast I began my usual morning activities. I started to notice that I had a little more pep in my step as I went on with my tasks. I didn't feel sluggish or groggy anymore, I actually felt pretty good! Now I can understand why my husband keeps these in his lunch bag at work. Right now 5-hour ENERGY® is hosting a “Yummification” Video Contest where you can win a share of $100,000!! 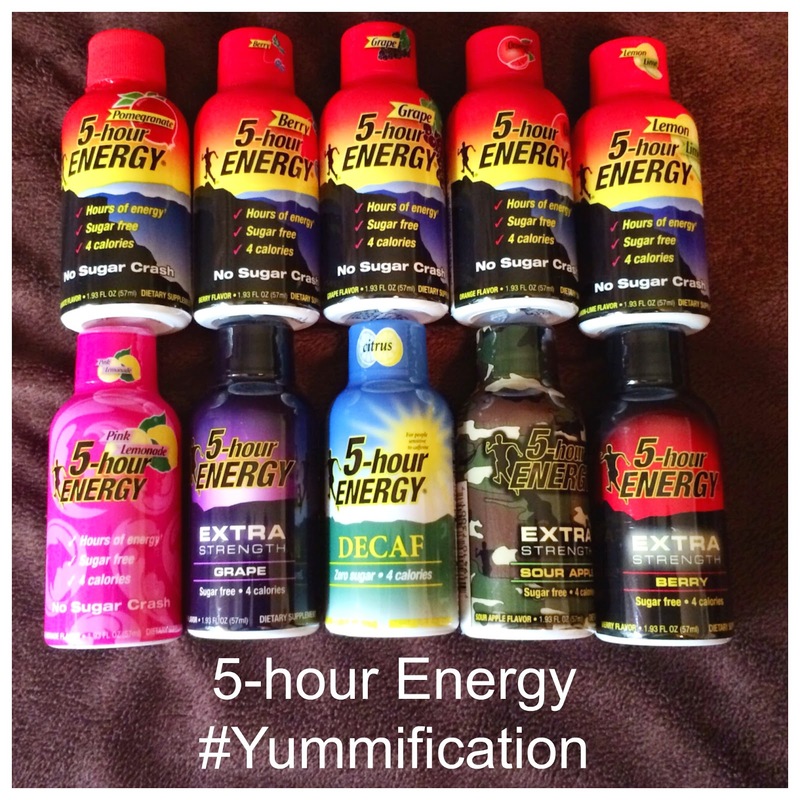 To enter the contest all you have to do is shoot a video of yourself making your own 5-hour ENERGY® “Yummification”. 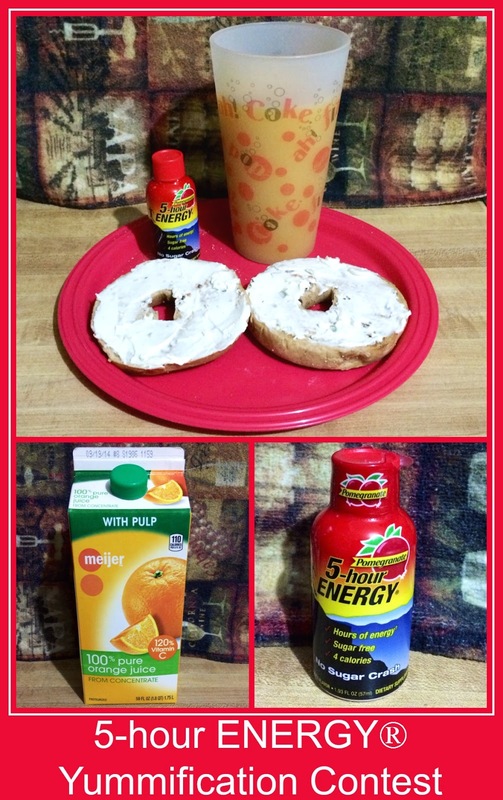 Simply mix (1) 5-hour ENERGY® shot with 1 or 2 (MAX) of the following approved beverages: Decaffeinated soda or cola, fruit juice, vegetable juice, smoothie, lemonade, decaffeinated tea (hot or iced) , or any form of water. Then give your “Yummification” a name. To enter the contest, visit www.5houryummification.com and follow the instructions to complete the entry form; “Like” 5-hour ENERGY® on Facebook, then create and submit a video that is no longer than 60 seconds showing an original combination being made, tasted, and named (creativity counts!). Entries must be received by August 19, 2014 at 11:59 p.m. EDT to be eligible. No purchase necessary. US residents only. 18 years and up. • Zero sugar, zero carbs, zero herbal stimulants and 4 calories! Win it: One lucky reader will win a 5-hour ENERGY® variety pack and $25 Visa gift card. This giveaway will end August 23rd at 12:00 AM EST. The winner will have 48 hours to respond to my email. If no response, a new winner will be chosen. Open to residents of the US.